This curated list of resources will help you research information about atoms. Read the descriptions to find out whether a site sounds right for what you want to know. Some sites may be more challenging reading, while others may offer solid basic information. Be sure to try several sources. There are resources for elementary, middle, and high school levels. Many of these tools are more appropriate for middle and high school students. In the younger grades, the tools could be used as a teacher-led activity. Share the interactive sites on your projector with the class. List these tools on your website for students to use for review and preparation for a test. These educator-reviewed resources from TeachersFirst offer audio books so all students, including emerging readers and ESL/ELL learners, can experience literature and other reading selections in audio form to reinforce and inspire literacy skills and enjoyment. Mark this one in your professional favorites AND share it on a class web page for access by students and parents. The helpful reviews suggest ideas for ways to use the audio books in the classroom or outside of school to reinforce literacy skills, improve English skills, or study literature in new ways. These educator-reviewed resources from TeachersFirst offer audio books with accompanying text so all students, including emerging readers and ESL/ELL learners, can experience literature and other reading selections in audio form as they reinforce and inspire literacy skills and enjoyment. Be sure to explore each site, as many include multiple types of activities, including the audio books and texts. Mark this one in your professional favorites AND share it on a class web page for access by students and parents. The helpful reviews suggest ideas for ways to use the books in the classroom or outside of school to reinforce literacy skills, improve English skills, or study literature in new ways. This collection of reviewed resources will help you to better understand these students with special challenges and find strategies for working with them in your classroom. Share this collection with parents and colleagues using the "email this" link. Looking for a way to include baseball in your teaching? Whether it is time for Spring Training or the World Series, browse these options for curriculum connections to engage the sports fans in your classroom. As spring or the World Series approaches, look to this collection for connections between your curriculum and baseball. Invite students to create their own baseball-related activities using the concepts you are studying right now: math word problems, scientific analysis of baseball physics, baseball writing ideas, or primary source interviewing about baseball. These reviewed resources from the TeacherFirst database include teaching ideas, research material, and interactive sites for studying Black History in all grades. Browse this collection as you approach Black History month or simply to add multi-cultural dimension to many history lessons. This collection of reviewed resources from TeachersFirst is selected to help teachers, parents, and students manage the tough issues of bullying and cyberbullying. Whether you plan a special unit or lesson on this topic for Bullying Prevention Week or select from these resources on an as-needed basis, you will find useful ideas and strategies for students and adults to work together to erase bullying from your class and school culture. Be sure to share these resources with parents and your parent organization via your class or school web page. Use the resources in this collection if ever in need of help concerning bullying online or in the classroom. Be sure to pass this one along to parents, counselors or peers if bullying is ever a concern or issue. This collection of resources will help you research information about cells. There are resources for elementary, middle, and high school levels. Find tools for all grade levels. Read the recommended grade levels with each review. Materials include interactives, resource guides, and more. Check back often, as new resources are frequently added. Be sure to try several sources. Share the interactive sites on your projector with the class. List these tools on your website for students to use for review and preparation for a test. A few of these are device agnostic and available as both an app and on the web. This collection of reviewed resources from TeachersFirst is selected to help teachers and students build a better understanding of other cultures, especially China, through related projects and classroom activities. Every culture tends to focus on its own way of thinking and doing. In order to prepare our students for life, twenty-first century classrooms must foster cross-cultural understanding as a vital aspect of learning in today's global society. This collection of reviewed resources from TeachersFirst is selected to help teachers and students build a better understanding of other cultures, especially China, through related projects and classroom activities. TeachersFirst welcomes suggestions of additional free teaching resources for our team to review. Please mention "cross-cultural" in your message. Share this collection as a starter page for projects when your class is studying China. Have students create their own cross-cultural projects using an online poster tool such as Web Poster Wizard, reviewed here or a comic creator from this collection. Our own collection of Christmas resources concentrates on Christmas customs in other countries and time periods. Lots of resources for an interesting exploration of how the Christmas holiday developed. Try our Giving Tree lesson with your elementary students. Find resources and activities appropriate for Cinco de Mayo in this collection from TeachersFirst. Use these resources to connect Cinco de Mayo to your curriculum in almost any subject or select one or two ideas to highlight along with your regular lessons. This collection of resources about climate change is selected to help teachers and students learn more about the short and long term impact of climate change. As students read and see images of climate change then, now, and in the future, they will gain a better understanding. Younger students may have more questions as you explore together. Use these resources with your students to find ways you can all make a difference. Use this opportunity to teach about persuasive writing (letters to the editor or government officials), careers in science, current events, and more. 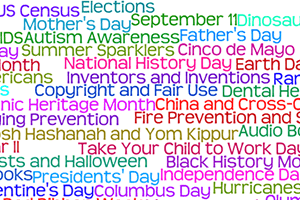 Find resources and activities appropriate for Columbus Day in this collection from TeachersFirst. Use these resources to connect Columbus Day to your curriculum in almost any subject or select one or two ideas to highlight along with your regular lessons. This collection of reviewed resources from TeachersFirst is selected to help teachers and students learn about and create comics in any subject area. Comics have become mainstream in "graphic novels" and can express or explain major concepts, portray the underlying tensions behind an issue, or simply help students remember terms and definitions. The storytelling potential of comics goes back to cave drawings and can be as simple as a stick figure or as elaborate as a photograph annotated with voice bubbles. Explore these resources for tools and ideas to "draw" comics into your classroom as a tool for learning. Many of these resources trace the history and technique of various comics, providing an interesting area of study or examples for student-made comics. Choose a comic creator tool for students to use in your class to reinforce curriculum concepts. With younger students or those who need examples, create the first comic(s) together on interactive whiteboard or projector as a closure activity to reinforce concepts before a test. Gradually allow students to create their own comics (or collections of comics) to tell stories, review concepts, or make political comments. More techno-savvy students will appreciate the variety of tool options offered here. Dig into the meaning of computational thinking with this collection of resources. Computational thinking is expressing solutions so that humans and computers can understand them. A great way to visualize how to embed it in your classroom is to have the students think like the physicist, economist, artist, mathematician, etc. to identify the problems that need to be explored. This is not programming computers but logical ways for problem-solving. It is a problem-solving tool for every classroom that has students think like a problem solver and use higher level cognitive skills. Bring problem-solving and computational thinking into your classroom with these tools. Share on your class website, projector, whiteboard, or on individual devices. Topics range from coding to charts to logic. This collection of reviewed resources from TeachersFirst is selected to help teachers and students learn about the United States Constitution and to plan projects and classroom activities so students can experience the Constitution as a "living document." Whether you spend one class in celebration of Constitution Day or an entire unit on the Constitution, the ideas included in the "In the Classroom" portion of reviews will launch discussions and projects your students will not forget. Use the resources in this collection to supplement a unit on the American Constitution. The resources on this site could be used for webquests, learning centers, lesson plans & the like. American History teachers will love this one!